Here are pictures of my project taken recently. 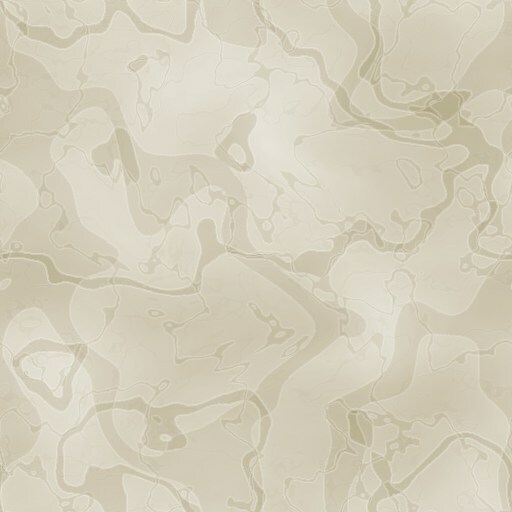 These show the leading edge glassing method I use now. It requires no foam or hotwire, and is considerably cheaper as a result! 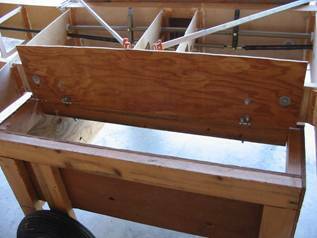 Balsa stringers are temporarily superglued along the leading edge wing ribs 0, 2, and 3. These support the paper to follow across the long distance between the ribs. For ribs mounted closer together, or greater curves of the paper, these are not necessary. The next picture shows poster paper (the kind you buy for signs and crafts at the drugstore (not the foam kind!) taped into place on the leading edge. This gives sufficient shape to hold the glass. 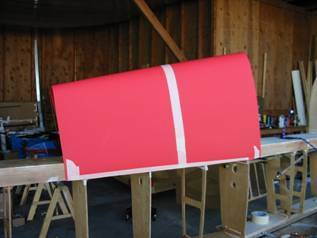 Trim the paper to the trailing edge of the spar. Cut garbage bags or thick Mylar, acetate, etc. to fit on the construction paper. Allow reasonably generous (about a couple inches) overhang. Nip a small triangle out of the plastic where it crosses the leading edge. This marks it for later. This is a similar trick that someone would use while matching patterns to cloth while sewing. Do NOT tape the plastic in place! Remove the plastic and place it on a flat table. Cut glass cloth to fit so it is aligned 45 degrees from the line between the two nips you cut in the plastic while it was on the wing. Now just glass right there on the table to the garbage bag (or whatever you used!). You can work fast here, since you are not fighting gravity and the thickening epoxy as you work. No need to coat the plastic before you lay the cloth...just pour on the epoxy and squeegee it in. Things will fill in nicely anyway by wicking under the glass fibers, and this is just the first ply anyhow. Do only one ply. If you wish, you can glass a sheet of peel-ply on top, but you'll have to work fast, even with the slow hardener. Now just take your freshly glassed sheet and hang it on the construction paper form. Don't bother to tape it. The equal weight on either side keeps it in place. (Did I mention the form should be facing upright?) Now let it cure. The end result will be a single ply that is reasonably flexible cured in the shape you need. You can use this single ply as a form for further plies as you glass the leading edge onto the flight surface. When finished, just peel it from the construction paper (it's ok to destroy the paper now) and peel the garbage bag from the fiberglass. A finished leading edge and landing gear being fitted to one side. This picture is taken from top of the wing showing the balsa stringers have been removed. Shown above are the completed leading edges for the ailerons. These are ready to glue onto the spar and glass into place with the rest of the aileron glass. 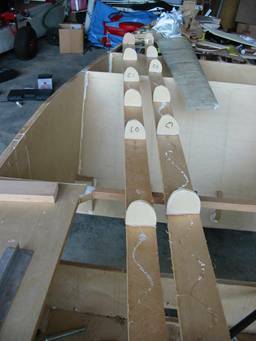 The same technique will work on any of the leading edges (elevator, flaps, fin, etc). 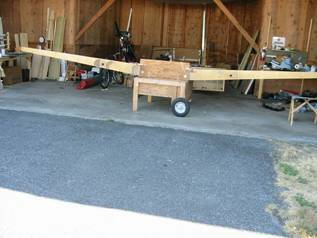 Incidentally, I have constructed a wing stand on wheels as shown in the photo. 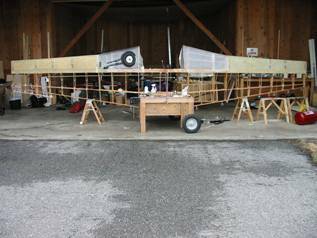 It uses wheelbarrow wheels, and the stand is constructed so I can rotate the wing up on either the leading edge or trailing edge. 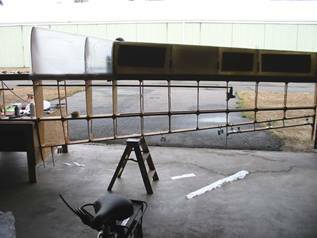 The hinged mount for the forward wing spar. 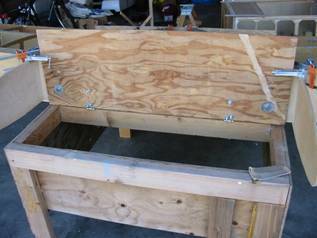 The hinged mount for the rear spar. 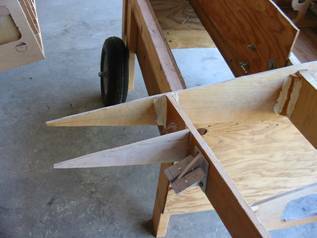 You can rotate the wing forward (see hinges in the photo) by removing the bolts from the rear spar mount, or vice versa, to tip the wing the other direction. 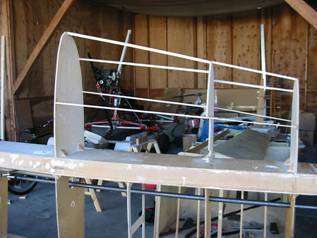 A rope and two small stepladders on either side help keep the wing in position while on edge. When down on the stand, the wing is easily moved about. This shows how the stand is built to clear rib 0 on either side as you rotate the wing onto an edge. Ed. note: Although these are not specified in your plans set, you builders will probably want to install gap seals for your control surfaces by continuing the wing skin [or stabilizer skin] aft towards the movable flap spar, or aileron spar, or elevator or rudder spar, whatever the case may be. Gap seals will reduce airframe drag and thus should add in incremental increase in your airspeed, while adding very little extra weight. Please note that the gap seal for the aileron along the top of the wing will need relief to allow for "up aileron" movement. Therefore it can't extend quite as far aft as the flap gap seal. Otherwise the wings' gap seal can be continuous from aileron to flap, along the length of the wing. A good way to make these gap seals or fillers is to use balsa wood as a core. 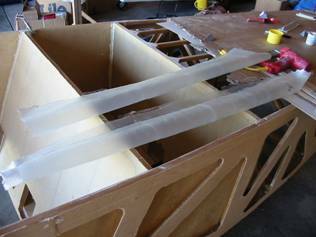 Cut and shape it as needed (wedge-shaped cross section), glue it permanently to the spar and extend your fiberglass over it when you put the final skin on the airfoil. You could also use foam for the core, but I prefer balsa wood in this case. It is a little more substantial	material to work with, since any long thin piece of foam is too easy to break during handling. Ed. More hints from Andy in our next newsletter! More hints and photos from Andy Campbell will appear in our next issue. Unfortunately, when I was traveling this summer I was unable to meet up with Andy	in person to write an article on his project. However, Andy graciously provided many photos and a writeup of his own, which I have used almost verbatim. Luckily he sent more material than I can use in this one newsletter issue, so we are happy to use the rest of his helpful hints in our next issue. The wing detaches, so why not the tail? To Andy, this seemed like a natural question. Especially since you might either have limited shop space, or you may have a need to detach the horizontal or vertical stabilizer at a later date for some other reason. The answer of course is to make these surfaces removable, and our next issue will outline how Andy has accomplished this on his project. If you are interested in this as a construction or a retrofit for your project, be sure and watch for it in our next issue. Until then, build and fly safely! In our last issue we mentioned that the locking, machined aluminum fuel caps Gary Rene used on his Celerity project were from Wicks Aircraft Supply. I subsequently received a friendly call from Aircraft Spruce and Specialty Company reminding me that they also sell this same part, listed in their catalog and also available on their Web site. (By the way, I was glad to see they read this newsletter!) 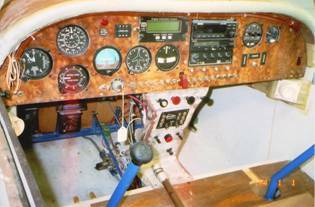 Actually, almost everything you need to build either the Celerity or Marathon airplane design is available from Aircraft Spruce and Wicks Aircraft. Both companies have our materials lists, so you can buy materials "kits" for your airplane without having to do your own parts counts from the plans that we furnish. And both companies have excellent reputations for service, quality, and dependability. I would not hesitate in any way to recommend Wicks OR Aircraft Spruce to any of our builders. They each know what you need for your project, and my experiences have been very positive with both of these suppliers.